The most important thing to remember when dealing with any bearing housing which features one half of its diameter in the head casting and one half in a separate cap or carrier is that they will be manufactured as a matched pair from the factory. On no account should they be mixed up, interchanged or turned around from their original position within the engine. When dismantling any engine it is good practice to always mark bearing caps for both position and location in the cylinder head. When referring to cylinder heads, the term line boring is usually applied to the camshaft housings. The line boring operation essentially restores both the sizing and alignment of these housings to ensure that the camshaft turns freely. In the case of cylinder heads, failure can occur as a result of oil pressure failure which can result in a camshaft seizing in its housings causing them to be damaged. This problem is most frequently experienced in heads where the cam runs directly in the aluminium housings. Timing belt failure can result in both camshaft and bearing cap breakage. In this case a replacement or newly manufactured bearing cap will be required and a line bore needed to correct both size and alignment. In cases where a cylinder head has been subjected to severe overheating, the casting may become distorted to the point where the camshaft housing is out of alignment. All or any of the above could mean that your cylinder head will need to be line bored. Essentially, there are two methods of retaining a camshaft within the cylinder head. The first is the cam in head design. This means that the camshaft will run totally within the main head casting effectively in a tunnel which will only be open at the ends of the head. The camshaft may run directly in the head material within the tunnel or the head may have additional separate bushes fitted. In this design, camshaft fitment can only be achieved by passing the cam through the length of the head. More common on modern and high performance engines is for the camshaft to be fitted partially in the main body of the cylinder head and then be secured by separate removable caps. In this split housing design, the camshaft is fitted from above the cylinder head during assembly. Probably the easiest method both in terms of machining and understanding is simply to enlarge the diameter of the housings in question. This is possible with either head design and will correct any damage or misalignment but will require the use of an oversize camshaft or suitable bearings to fit a standard camshaft. The downfall with this method is that quite often neither are readily available. With cam in head designs utilising separate bushes, it is often possible to enlarge the housing to accommodate oversize bushes which can readily be made to suit. Even where no bushes are present originally, it is sometimes possible to enlarge the housings to accept replacement bushes. 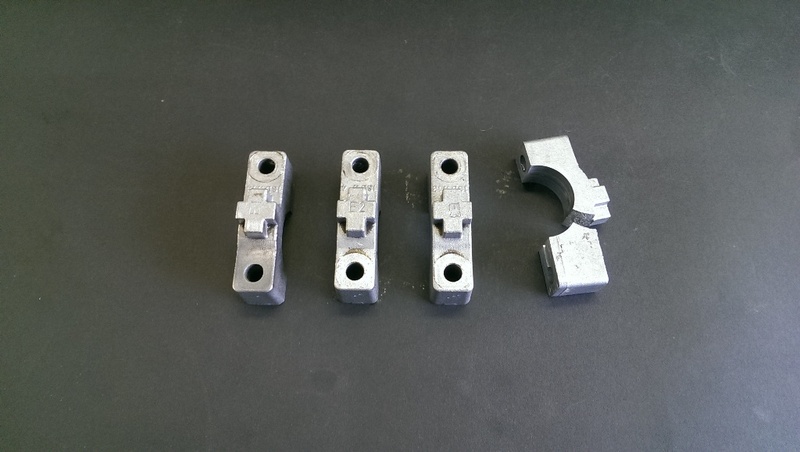 When dealing with the split housing design, the only way to restore the damaged housings to their original size involves the method termed “cut and shut”. This means that the parting faces of either the cap or parent casting (or both) are machined. This results in the original diameter becoming oval and creates a “tight spot” (which is greatest at 90 degrees to the split line) from which material can be removed. When this is rounded out, the original diameter is restored. The most material is removed from this point and virtually zero at the parting line itself. 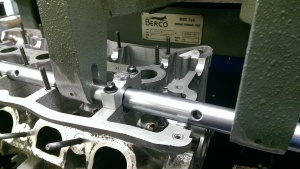 In all cases the machining processes performed using our BERCO BT6 machine ensures that the housings concerned are not only finished to the correct sizes but that they are bored in alignment with each other along the full length of the job.